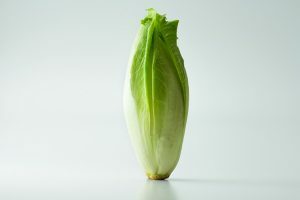 Endive, which has the scientific name Cichorium endivia, is a green, leafy vegetable that is a member of the daisy family and is of the genum Cichorium, which comprises of other bitter vegetable species such as Cichorium pumilum and Cichorium intybus. It can be consumed either cooked or raw, especially when mixed with other vegetables in a salad. Endive has three main varieties: the curly endive or frisee (var crispum), the escarole or broad-leaved endive (var latifolia), and the Belgian endive. The difference among these three varieties are mainly physical: curly endives have narrow and curly leaves, hence why they are called that way; escarole endives have broad leaves with serrated dentate margins with thick stalks; and Belgian endives have smooth, cream-colored leaves. Endive is rich in dietary fiber (six grams), which aids in digestion and deals with gastric issues by preventing occurrences of constipation and regulating bowel movement. The daily recommended intake of fiber for men and women are 38 g and 25 g, respectively. Fiber in endive is also good at reducing the risks of heart disease as it lowers total blood cholesterol levels by regulating the production of low-density lipoprotein or bad cholesterol levels in the body. Endive also regulates blood pressure and prevents the occurrences of inflammation, and improves lipid and insulin levels. Endive can also serve as a blood tonic; it regulates the blood creation process in the body, thus preventing us from incurring anemia. Vitamin K, which is responsible for maintaining acceptable levels of calcium in bones, thereby contributing to their strength and resilience, can be found in endives. As a matter of fact, one cup of endive contains 289 percent of the daily vitamin K requirement. Folate, which is present in endives, prevents the onset of Alzheimer’s disease and cognitive deterioration, and facilitates the proper functinioning of the neural system. One cup of endive is equal to 35 percent of the body’s daily folate requirement. Endive is a natural appetite-builder. It makes the gall bladder discharge proper bile levels, allowing toxic materials to be removed from the liver. It also prevents the buildup of gallstones in the body. Going in the opposite direction, endive is also known to have been consumed by people who are trying to lose weight. Endive consumption can naturally whiten skin and keep it free of acne. It can also facilitate hair growth and provide hair strength, ensuring that your tresses are long and strong. Endive can also initiate hair damage repair. Your oral health is protected when you regularly ingest endive as it prevents the growth of cancer cells that attack the oral cavity. Endive is good for the health of your eyes as it can prevent you from being afflicted with itching and dry eyes and eye ulcers, which is characterized by severe eye discharge and reduced vision. It also addresses serious eye conditions like cataracts, glaucoma, and macular degeneration, among others. Its vitamin A content is almost the same as the vitamin A content in carrots. Endives can be used in salads and soups. For a suggestion on how to make a delectable meal out of endive, visit this link. 4 Must-Have Grens to Add to Your Smoothie And Why? Endive ingestion can naturally whiten skin and keep it free of acne. Endive is a natural appetite-builder. Endive is rich in dietary fiber, which aids in digestion and deals with gastric issues.